Pictures from CollectionDX...check them out! My school, lovely old P.S.64 in Queens, was roughly 4 city blocks away in a serpentine route, so there were a few corners to turn at, and quite a few streets to cross for a child. My mother would watch until I reached the corner of our block and joined a small group of children. We'd then disappear around the corner, and would continue on our way under the watchful eye of one of the other kids' mom. Oddly enough, once we reached the incredibly busy thoroughfare that was 101st ave, and turned that particular corner, we were completely on our own. I'm sure our folks felt that since we were about a block away from the school and the only street to cross would be covered by the crossing guard at the school, that we'd be safe. Now, walking home was a different matter altogether. We had no supervision. We usually stuck together once we met up after the bell and would begin in mass, to migrate to out homes. It was during one of the migrations that one child mentioned going to the candy store down the block before heading home. Since we all stuck together, and no one wanted to explain why this one particular child was missing from our group, we all went to the candy store with him. The candy store was only half a block in the opposite direction of our way home, but to me it might as well have been in another city. We were off track, doing something we never asked permission to do. I was scared, but everyone else seemed at ease with it, so I just kept my mouth shut and went along. When I first set foot in that candy store, I was blown away! So many different kinds of candy, and trading cards. I had never seen some of this stuff before, and I was blown away. Having no money, I could not partake, but I watched as the other children with spending money bought this and that. 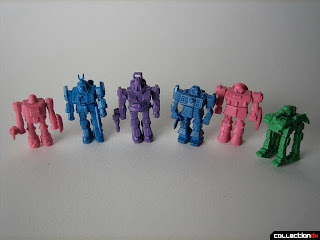 The next day in class, a couple of the boys from our group showed me these tiny colorful robots. 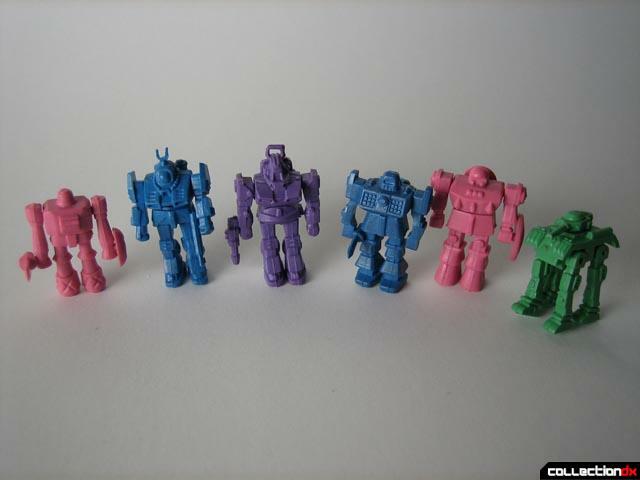 They were small enough to hide and play with on your desk, but in colors that could pass as an eraser in case the teacher caught you. You had to put them together. They had tiny weapons and their arms moved. In that moment I knew, I just *knew* I needed some. Not one, mind you, I needed some. I needed a few to stage battles in my desk. The next morning, I asked my mom for some money, and I said it was to buy candy on the way home. My mom assumed I meant I would stop at the little grocer store closest to our house which was on the way home. I didn't correct her. I knew I shouldn't be going the other way after school, but I couldn't help the thrill I got. The robots were only a dime. The person who ran the candy store obviously never charged tax on children paying in coins, because walking in with fifty cents allowed me to walk out with 5 robots. 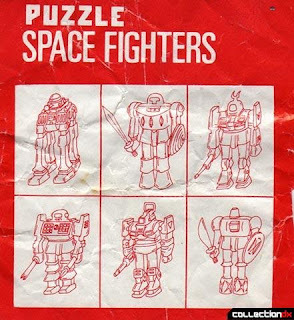 They were called Puzzle Space Fighters. They were obviously bootleg toys. They came in a baggy with candy. And they were the best ill gotten toys I ever had. Ten cents brought me so much happy and so much fun and I got away with it. I felt invincible. I felt free. I felt grown up. After that, I became less scared, and more adventuresome as a child. I stopped sticking to predetermined routes when running errands for my mom, and started to explore my neighborhood a little more. But *that's* a story for another day.